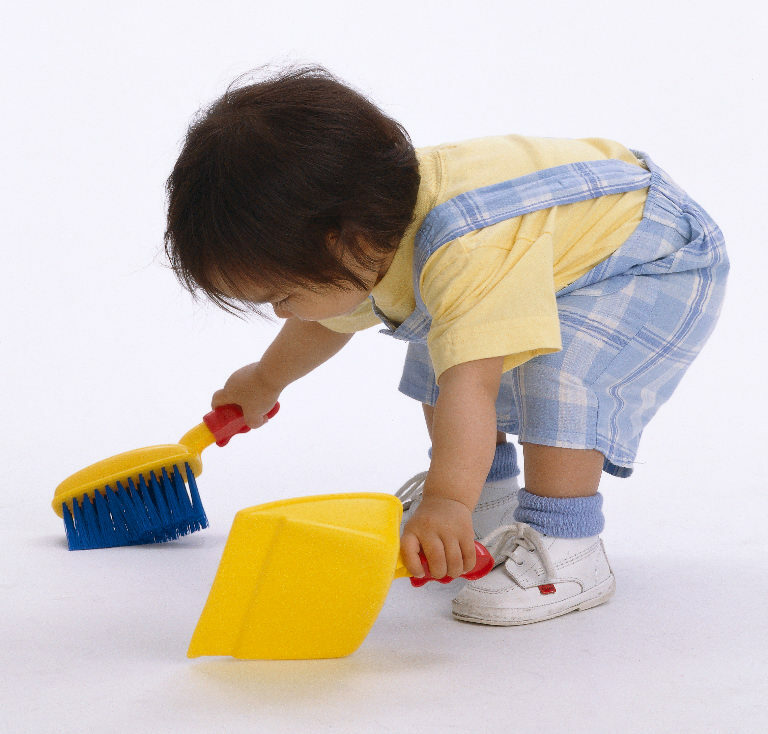 Vacation time is a good time as any to start getting children involved with household chores. Yes, part of it is about keeping them out of your hair just long enough for you to be able to accomplish whatever needs to be done, especially if you are a working mom -- but teaching kids to be responsible at an early age by assigning them household chores benefits child and parent both. 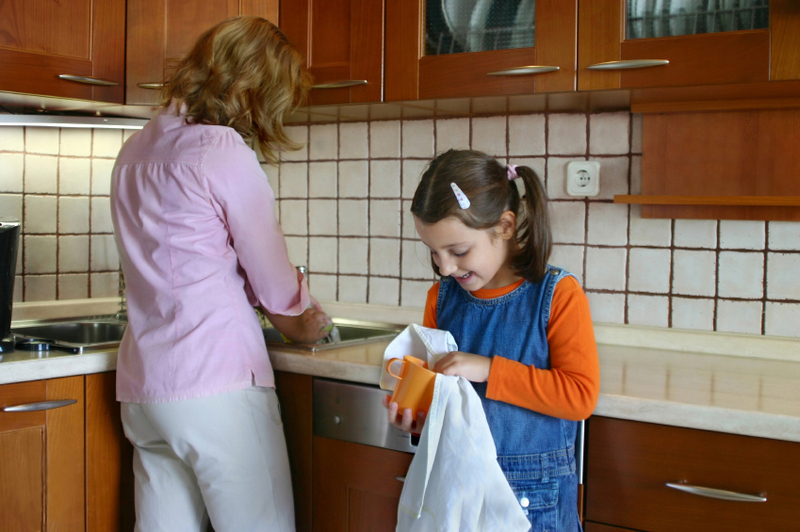 How do you manage to get your kids to help out with household chores? Read on to find out how to get kids to take responsibility at home and see some suggestions on age-appropriate chores. Sweeping floor. Do not disturb. Being allowed to help out with chores gives young ones an idea of how it is to run the household, helping them better appreciate the things you do for them. It gives them a sense of pride at having been able to contribute. You also make them feel needed, which is a basic need for all human beings. But most importantly, doing housework instills in them some values that they are going to need as adults. It has also been proven that household chores help children diagnosed with autism build self-confidence and be more self-reliant. So the earlier you start, the better it is for them. My seven-year-old is just starting to enjoy some minor responsibilities at home such as filling empty water bottles and putting them in the refrigerator (since we don't have a hot/cold water dispenser) and washing the dishes. She still has to step on a board to reach the sink but boy, she's already working the sponge like a pro! Last Sunday, her dad asked her to sweep the leaves littering the pavement out front. The broomstick fell apart somehow (it badly needed replacing anyway), but she managed the job just fine. We can't help but feel that we are off to a good start. Demonstrate first then let them help out. It is best to sit down with your children and discuss how you are going to divide the housework between yourselves. Experts say children are more likely to cooperate if you "ask them for help" instead of imposing on them to do particular jobs. You'd be surprised at how eager they would be to pitch in. As they grow older and their responsibilities grow bigger, you can make a list of tasks for each member of the family to avoid potential arguments. Making a chore chart or a chore schedule helps too. It gets easier once doing chores becomes a habit. Teaching kids to be responsible adults. It also helped to see that my mom and dad did their fair share of the house work. My dad, aside from being in charge of "manly" jobs such as plumbing/electrical repairs, always helped my mom out with the laundry when she is too busy. As we grew up, I realized that I am thankful for my parents for teaching us to be self-reliant and responsible. Now, every time we visit home, we still take it upon ourselves to pitch in - without being told. Even my brother, who is already a civil engineer, still washes dishes for us from time to time. Once your kids get started on doing household chores, do not hesitate to show your appreciation even as they are still completing their "jobs." Do not expect for them to do it perfectly the first or second time around. And make sure to show them how each chore is done before you ask them to do the job themselves. My daughter sometimes helps me fold clean laundry and I would always commend her for the effort... although I've occasionally had to "refold" some of the items she's folded. (I do it when she's asleep so I don't hurt her feelings.) Remember that for them, "learning" is as good as "doing" - and they will get better with practice, so we also need to be patient. The first thing to do is show the kids how a particular household chore is done. Then, allow them to help you next time. 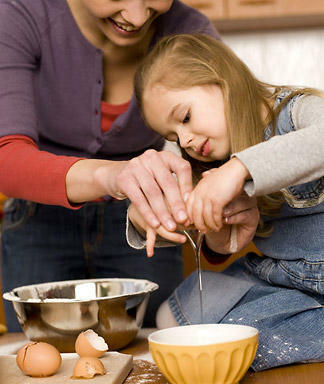 When you feel that they are ready, allow them to do it themselves - with your supervision of course. For more complex tasks such as cleaning their rooms, give specific instructions and reasonable deadlines. And don't forget to give praise for their effort as they go along! Constant reminders don't hurt, but for minor daily tasks such as making the bed and picking up toys, try to teach kids to perform their chores without being told. I think boys in general like washing cars, don't you? Set place mats on the table. Set the table during mealtime. Help ready-to-fold clean clothes into piles for each family member. Hand you wet clothes for hanging. Kids enjoy the feeling of making mom and dad happy by helping out! Help wash and hang out clothes. Oh look, the rake is even bigger than her. So cute! Cook simple meals (with supervision). As your kids' level of mastery in their assigned chores improve, gradually introduce new tasks to keep things interesting. You will be amazed at what kids can do! Some pre-teen kids can prepare meals and do their own laundry without adult supervision. That sure takes a huge load off your shoulders - and you can sure stop worrying when it's finally time for them to move out and find their own way in the world.